It’s been a couple of months since Nora wrote in with a request, and I apologize for the delay, Nora! We’ve had a busy summer, and fall is seeming to be no different. But, I wanted to get you this recipe while I have a moment tonight! Nora wrote in: Looking for grain free tortillas as a quick dinner option for my family. I’ve made tortillas in the past, but always with grain. Ever done a grain-free tortilla? Since Nora sent in her request, I’ve been searching and experimenting. I started with browsing Google. Most “natural” recipes you’ll find recommend using corn flour or other flours that will turn to sugar quickly inside of you. But I did get some ideas on how to actually make tortillas, since I’d never attempted in the past, so it was a good use of my time! Then I started to experiment. Let me say that coconut flour does not make the best tortillas. They were more like crepes and fell apart easily. I tried around 4 or 5 batches of various flours/mixes and came down to this recipe which has turned out great three times in a row! So here it is for you, Nora! I hope this helps your family out. Dave and I have enjoyed the sampling of different tortillas and this recipe is a keeper! 1.) In a small bowl, let flax sit in boiling water for about 5 minutes. 2.) In a separate medium bowl, mix together the almond flour and sea salt with a fork. Add the egg, flax mixture and honey, one at a time, to the almond flour. Stir until it forms a firm dough that isn’t too sticky to handle. If it is too sticky, add more almond flour until you can easily roll it into a ball. 3.) Cut the ball in into quarters. Cut each of the 4 pieces in half making 8 pieces total. 4.) (I lack a tortilla press. If you’re in the same boat, follow these steps..) Place a strip of all natural waxed paper on your counter. One at a time, take a piece of dough and roll it into a ball with your hands. Place the piece of dough in the center of the waxed paper. Place another strip of waxed paper over the dough ball. 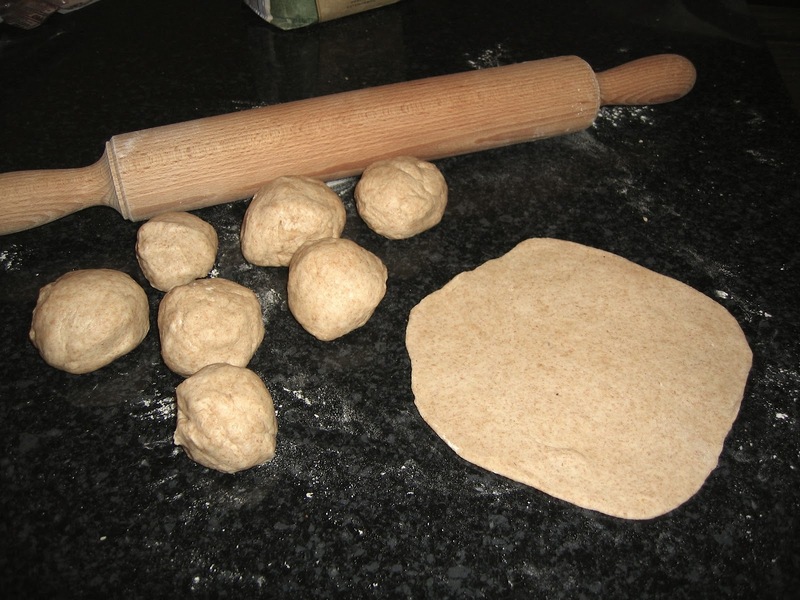 Use a rolling pin to roll out the dough until it is as thin as you can get it without it falling apart. 5.) Oil a cast iron skillet with coconut oil and heat skillet to Medium heat. Be sure to give the pan plenty of time to heat before adding your first tortilla, a good 8 minutes is sometimes needed for the best cast iron pans. As you get into making tortilla #2-3, you may find they are browning more quickly. Go ahead and lower the temperature to Medium-Low to prevent burning. 6.) Remove the waxed paper from the tortilla. Just like moving pie crust, gently put your non-dominant hand underneath the waxed paper under the tortilla. Flip the tortilla onto your dominant hand while you peel away the waxed paper. Then gently place it into the skillet. If there are folds, try to even them out, or just mush them down with a spatula. Cook for about 1 minute on each side, or until golden brown. The edges will brown and the middle will start to bubble. 7.) Flip and cook on the other side for another minute or less. Cook each tortilla one at a time. Add more coconut oil as the skillet becomes dry. As the tortillas cook, stack them up on a plate and cover until you’re ready to use them, to keep them warm. You can make ahead and freeze the tortillas once cooled or just keep them in the fridge in a glass container for a few days. I am trying to stick to the Advanced eating plan but REALLY missed a wrap. This recipe sounded perfect but I had to find a substitute for honey. I boiled white balsamic vinegar and it turns into the stickiest goo you have ever seen. Thinking I have found a way to make your wraps, I am afraid not! They are tasty with the vinegar and I am using them as crackers for my hummus but a wrap still eludes me! Wow, vinegar?? How did you think of that?! I’ve never heard of such a thing, hmm! What would you use the vinegar goo for otherwise? Sounds interesting! Yes, I’m sorry but it really does need that honey for binding.. I haven’t tried this, but maybe you could boil down some Granny Smith apples into a syrup? Not sure how well that would go over tho since such little sugar content. I followed the recipe exactly and my tortillas fell apart when I tried to flip them over in my cast iron skillet. Also, they made tasty ‘pita chips’! ;o) My daughter absolutely refuses to eat any “dough” etc. that is made with almond flour. Is it possible to do garbanzo bean flour instead and get the tortilla taste? Hi Melanie! Sorry for the poor results. Not sure what went wrong, but definitely like the pita chips idea. ;) I’ve not tried myself, but I’m sure garbanzo bean flour would work. It should be virtually tasteless. Give it a go, and if you get a recipe that works well please email it to me and I’ll share as a guest post by you! I am so excited to find these!! I was grain-free for months, and then went off and am trying to come back – tortillas are one of the main things that makes it hard for me to do without grains. Thank you for the recipe! Great Natalie! Glad to have you back on the bandwagon! If you haven’t picked it up yet, I highly recommend getting a copy of the Maximized Living Nutrition Plans book from your Maximized Living doctor. It will provide all the guidance you need that my recipes go on to support. My tortillas fell apart. Your ‘dough’ looks smooth, mine was on the crumbly side. I used Honeyville Almond Flour should I have used something different? I ground the brown flax seed in a coffee grinder, added the hot water. After 5 it was still slightly watery – should I have let it sit a little longer until it was thick? Your feedback would be helpful before I attempt round two. thanks! Hi there, Honeyville almond flour should have been just fine — make sure it was their fine ground option. If it was more of an almond meal type texture, that could be the culprit of a crumbly dough. It’s hard to tell without being able to see the consistency of your flax/water mixture if it was gelled up enough. Next time you can also try adding in a little extra water, maybe a Tbsp at a time, until the dough holds up. It should come together in a nice ball and be fairly hands friendly. Let me know if you have the same issues round two and we’ll try to work on it! mine turned out as a crumble too.. i made sure to get the flax mix extra gooey.. added a tiny pinch extra flax. My almond flour was very fine too. it would not roll out, so I placed it on the skillet and flattened it there with the hopes to flip it. I’m abit bummed because I thought this was finally a solution. However on the up side the crumble taste very good.. will have to use it in a parfiat or pudding ect! Are these a crispy tortilla? I’m looking for a soft tortilla that I can use for burritos and soft tacos. I have to go low carb and gluten free, and it’s a challenge trying to find substitutes for the things that you loved. Hi Fonda, Sorry about the crumbling problems. I recommend adding a little more water to the mix at 1Tbsp at a time until you reach a more doughy consistency. Also, you can place the tortilla dough balls in the fridge for a few minutes to firm up before pressing out. Next time try using a flat board or plate bottom to flatten out the tortilla balls rather than a rolling pin. You may have better luck that way. But isn’t flax seed considered a grain? It seems to be not permitted on the grain-free specific carbohydrate diet. Hi there, Flax seeds are considered seeds, not grains, so they are Advanced Plan approved. High in fiber and healthy fat! What about using malitol syrup instead of honey? Flas isn’t allowed on SCD becuase they are a mucilaginous (polysaccharide complex)/ This can be a problem for SCD people. Great point about flax seeds and SCD. As long as you are grinding the flax seeds finely, you should have no issues consuming and having them get stuck in the intestine. The risk of that happening is when you consume whole flax or chia seeds. In fact the added fiber of ground flax should help with issues someone with IBS/Crohn’s/IBD/etc suffers from. You can use malitol syrup if you wish. It won’t taste quite as sweet as honey, but it’s really just added to bind the dough together that little bit. I tried these too. Taste was great! I didn’t notice to ground the flax though. I think that was the problem. I got a crunchy crumbly chip like result. How thin do you roll them out? Hi there! Glad the taste was good, but sorry they turned out like chips for you. I’m not sure the issue for those who have written with the crunchy tip texture?? Perhaps using too much oil in the skillet? You don’t want so much oil in the skillet that it fries the tortilla — this will create the crunchy texture. It’s just enough oil to soak into the cast iron skillet to make non-stick, and then the rest is like cooking a crepe or pancake. And just 1 minute on each side, or else it’ll cook too long and dry out on you (won’t be wrap-able). You can also try adding a little more water or flax-water mixture to the dough if you feel it’s too dry/crumbly in the rolling-out stage. I’m going to give these a try as well! I have tried multiple grain free tortillas and never had any luck with them sticking together! Thanks for sharing! I hope you enjoy the recipe as much as we do, Jane! Worst recipe ever. I am a very good baker/cook in the kitchen and this recipe simply did not work. The tortillas fall apart and are not pliable at all. Are the flax seeds necessary for the tortillas or is there something I can substitute? Thanks for the recipe! You can replace with the same amount of gelled chia seeds or 1 beaten egg. Is there something I could sub in for the egg? We’re gluten, dairy, and egg free here, but I really want some tortillas. Hi Sarah, You can try subbing 1/4 cup of chia seed gel and 1/2 tsp baking soda. I haven’t tried it myself, but it might work. Good luck! It also may need a few Tbsp of arrowroot powder to hold everything together as it fries up. Sorry, I haven’t dabbled in an egg-free version yet. Let me know what you find to work for you! Add enough water (or almond milk) to form a soft dough. Place a ball of dough between 2 ziploc bags and press flat with a plate (I use clear pyrex pie plate so I can see through it). Be sure to spray a mist of PAM or other spray on the ziploc bags so they don’t stick when you peel them off. Throw on griddle and brown both sides. No need to worry about cooking thoroughly because there’s nothing raw except the almonds themselves. Makes 18 (3-inch). 1 tortilla: 3.9g Protein; <1g Carbs; 7.3g Fat(the good kind); 1.8g Fiber ENJOY!! I am going to give these a go. I am curious if you have used gelatin before in place of the flax seed to get it to bind up? I have pure fish gelatin, and was thinking of substituting it. Any thoughts? I haven’t used gelatin before, but it’s certainly worth the try. I recommend grass fed beef gelatin personally. It’s hard to guarantee the purity of a fish gelatin. Just made ese and I’m impressed! The taste and texture are amazing! Great job! Hi, is it okay to use ground flax meal instead of grinding the flax seeds? thanks! Hi Kim! You can used pre-ground flax. The reason I suggest grinding it yourself is because the ground flax will be fresh and the nutrients left full and intact. If you use pre-ground, the healthy fats and nutrients have oxidized and the flax is much less nutrient dense. But, using pre-ground will not change the outcome of the tortillas. ← Video: Making Chocolate Pudding with Dr. Scott!